RoyalPusaGold | Jasmine Food Corporation Sdn. Bhd. 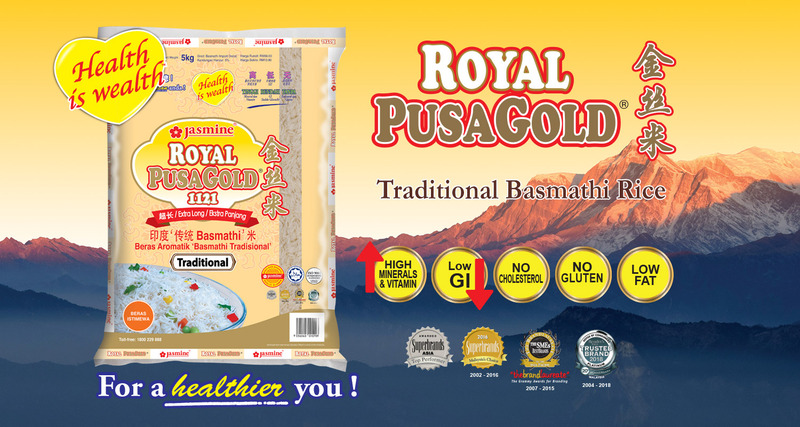 What is Royal PusaGold Traditional Basmathi? Royal PusaGold 金丝米 traditional basmathi possesses benefits which are well-known among connoisseurs who also discern its taste and flavour. Royal PusaGold 金丝米 is processed in the traditional Indian way and goes through an aging process of about a year. After cooking, it elongates to almost twice the length of the original grain size and has a fluffy, light-feel that come with a natural aroma. Due to its natural taste and aroma, Royal PusaGold 金丝米 appeals to the Asian palate and goes well with their cuisine. The light and fluffy features of Royal PusaGold 金丝米 also make the dining experience more enjoyable. This specially selected variety is known as the ‘Fragrant One’ and was the staple of Indian kings and Maharajahs of the past. Try Royal PusaGold 金丝米 today. It’s the best decision you’ll make for you and your family! 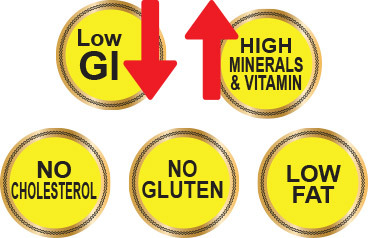 Apart from its taste, Royal PusaGold 金丝米 has a low Glycemic Index (GI) score. Glycemic Index measures the effects of carbohydrate on blood sugar levels. Foods with lower GI help to slow down the conversion of carbohydrate into blood sugar. Royal PusaGold 金丝米 contains beneficial nutrients such as complex carbohydrates, protein, calcium, iron, potassium, phosphorous and various vitamins that our body needs. Put the extra virgin olive oil, red chillies, garlic and onion into the food processor and blend until you get a smooth paste. Remove from blender and put the paste into a small bowl. Then add the salt, sugar and lemon juice and mix well. Set aside. Rinse the food processor. Combine ginger, garlic and spring onion into the food processor until you get a rough paste. Set aside 2 tablespoons for marinating the chicken. Then put the rest of the paste into heat resistant bowl. Heat up 5 tablespoons of extra virgin oil in a frying pan and pour over the paste, add the salt, sugar and lime juice and mix well. Set aside. Clean and wash the chicken, fat trimmed from under skin near the top and bottom of cavity.Then rub the chicken skin and cavity with 2 tablespoons of salt and 2 tablespoons of the ginger and spring onion sauce (without seasonings) set aside in step 2 above. Fill a pot with half full of water and bring to a boil. Submerge the chicken into the boiling water and resume the boil and skim the surface. Add all the dried Chinese red dates. Once its boiling, turn the heat down to low, cover with lid and simmer for 30 minutes. Turn off the heat. Cautiously remove the chicken and place on a plate and set aside. Reserve the chicken broth for cooking the rice and to serve as complementary soup. Discard the Chinese red dates. Wash the rice and place into the rice cooker together with the extra virgin olive oil, pandan leaves and ginger and cook in an electric rice cooker by adding number of cups of water specified by the electric cooker. Cut the chicken into quarters and remove the chicken meat from the bones carefully. Next, cut the boneless chicken quarters into bite size pieces. Drizzle the dressing onto the chicken pieces and garnish with coriander. 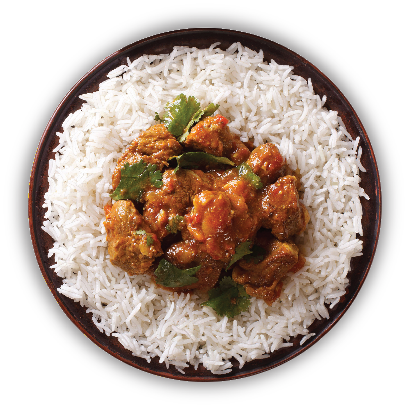 Serve the chicken with fragrant rice, chilli sauce, ginger sauce, cucumber and remaining chicken broth garnished with coriander. Download the recipe for Hainanese Chicken Rice here. Requires Adobe pdf to view. Royal PusaGold 金丝米 is available at all hypermarkets, retails outlets and medical halls. Have a question or need more information about Royal PusaGold? Click here to connect with us! For our mailing address, telephone, fax and email contact, click here!